1. It does not give priority to function. 2. It fixates on appearance, novelty or celebrity connection. 3. It costs more than it should. 4. It glorifies the designer. The Philippe Starck juicer shown in the blog of April 13 is a "snobject" par excellence. Functionally defective, it boasts of its "legginess," sells for $100 and is even offered as a non-functional, collectible miniature (4.5 inches high) for $49. The field of watches is full of "snobjects." The so-called "Museum Watch" sold by Movado is a good example and rewards analysis. It was originally designed by Nathan George Horwitt (1898-1990) in 1947. It was a wristwatch with a plain black face without numerals and with a white disk marking the 12 o-clock position. It was pirated by Movado in 1948. Horwitt sued. Twenty-seven years later, in 1975, Movado settled with him for $29,000. Movado now touts Nathan George Horwitt as "the first artist to explore the concept of time as design." Nowadays Movado offers eleven "Museum" watches for sale. In a very funny development, three of those watches supplement the original disk at 12-o-clock with a face full of hourly markings, thus completely contradicting the intention of the original design. Incidentally, the prices range from $495 to $1,495. The sordid commercial history of this design is not our focus. What is most interesting is that this watch is exalted as a "museum" piece despite undermining the main functional purpose of a watch. The sequence of events appears to be that it was accepted in the Design Collection of New York's Museum of Modern Art, Movado later began calling it the "Museum" watch and later registered a trademark for that name. The reputation of this design owes more to the gullibility and lack of design standards of our time than to any true design merit. It would be a fitting watch to be worn by the Emperor in Hans Christian Anderson's wonderful tale "The Emperor's Clothes." A watch without clear indications of the hours is a proper accessory for a person who wears non-existent clothing. It also fits perfectly into a decadent society which turns timepieces into frivolous jewelry. No one who actually needs to tell time quickly and accurately would dream of relying on this design. It takes a person who has lost touch with reality and is living in a world of arty-farty abstractions to exalt the removal of time indicia from a timekeeping mechanism. Where would we find such a person? Heading the design department of a museum perhaps. 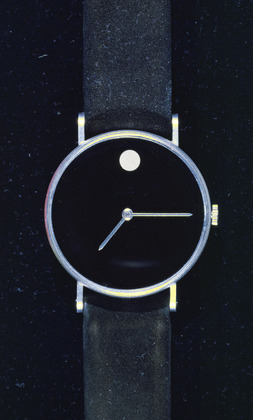 It would be a noble gesture if, to make amends for accepting this watch as a gift from the designer in 1960 and as a penance for enabling this sterile and functionally impaired object to become a "snobject", the Museum of Modern Art would expel it from the collection for failure to meet the standards of good design. Of course, that would be a dangerous precedent and might require the expulsion of countless other objects. The search for "snobjects" will continue in the next part. I neglected to contrast the vastly overrated Movado Museum watch with a truly good design, functional (with a superb additional feature), inexpensive and modestly presented. 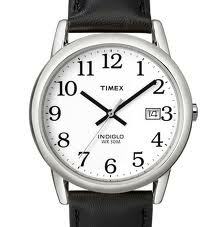 I refer to the Timex Easy Reader watches, available in various styles from $29 to $65. Some of them have a feature which allows them to be read in the dark with the push of a button. These are watches which a true design connoisseur will be proud to wear.